Psychologist, researcher and author Gabriele Oettingen, PhD. has been studying human behaviour for over 30 years, with a focus on goal setting and turning positive fantasies into reality. She has written over 150 scientific articles and book chapters relating to social and personality psychology, developmental and educational psychology, and health and clinical psychology on the topics of thinking about the future and the control of cognition, emotion, and behaviour. 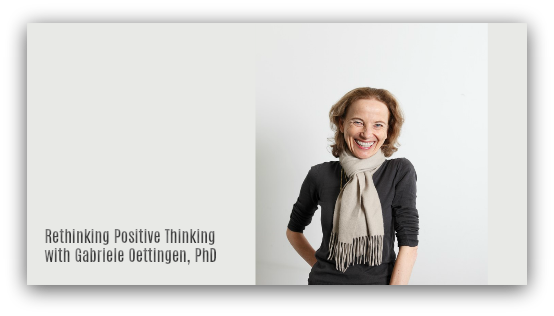 During the course of her research, Dr. Oettingen has concluded that positive thinking in itself, while popular, is unlikely to result in desired outcomes. Instead, she offers Mental Contrasting, an empirically validated process, helping people not just to identify their goals but to manifest them in all areas of life, including health, career, academics, and relationships. In this interview, she shares her simple yet powerful 4-step WOOP strategy, along with tips for maximising its efficacy. [00:00:09] Professor of Psychology, New York University. [00:00:22] PhD: Ludwig Maximilian University of Munich and Max Planck Institute for Behavioral Physiology, Seewiesen, Germany. [00:01:10] Book: Rethinking Positive Thinking: Inside the New Science of Motivation, by Gabriele Oettingen. [00:05:19] Study: Oettingen, Gabriele, and Thomas A. Wadden. "Expectation, fantasy, and weight loss: Is the impact of positive thinking always positive?." Cognitive Therapy and Research 15.2 (1991): 167-175. [00:06:15] Positive fantasies, worse outcomes. [00:08:12] Study: Oettingen, Gabriele, and Doris Mayer. "The motivating function of thinking about the future: expectations versus fantasies." Journal of personality and social psychology 83.5 (2002): 1198. [00:10:18] Podcasts: How to Create Behavior Change and Why We Self-Sabotage (And What To Do Instead), with Simon Marshall. [00:10:42] Why is positive thinking so popular? [00:12:49] Podcast: The Epidemic We Don’t Talk About, with Erik Kerr. [00:20:18] Emotional obstacles, habits, irrational beliefs. [00:22:15] Wish, Outcome, Obstacle, Plan (WOOP). [00:23:37] Wish: dear to your heart, feasible, challenging. [00:27:06] Study: Kappes, Heather Barry, Bettina Schwörer, and Gabriele Oettingen. "Needs instigate positive fantasies of idealized futures." European Journal of Social Psychology 42.3 (2012): 299-307. [00:28:48] WOOP as a skill. [00:34:25] How WOOP works; non-conscious consequences. [00:39:08] Prerequisites: openness, 5 minutes. [00:40:57] For those with low expectations. [00:44:18] Other methods of behaviour change. [00:44:38] Incentives, self-efficacy, social comparison. [00:46:44] Changing content of goals. Implicit theories. Book: Mindset: The New Psychology of Success, by Carol Dweck. [00:47:26] E. Tory Higgins. Prevention-Promotion, Approach-Avoidance: Regulatory Focus Theory. [00:49:31] Using non-conscious processes to conquer other non-conscious processes. [00:50:33] Example: WOOP in action. [01:02:25] Book: Rethinking Positive Thinking: Inside the New Science of Motivation, by Gabriele Oettingen.